The new issue of the UK's Classic Rock magazine (cover date September 2018, issue number 253) is well worth tracking down. A detailed, four page article takes a close look at Nick Mason's new project - his Saucerful Of Secrets - and speaks to all five members of the band. For those wondering where the idea came from, and how the band members were assembled, the details are revealed by the men themselves. With the European tour starting in just over a week in Stockholm, Sweden, and the Unattended Luggage limited edition box set coming out next Friday, it is little surprise that there is a strong focus on all things Nick at present. Elsewhere in the magazine is a review of the box set, and a large review of the BST Hyde Park festival, which of course started with Roger Waters headlining the first day, presenting an outdoor version of his current Us + Them tour. 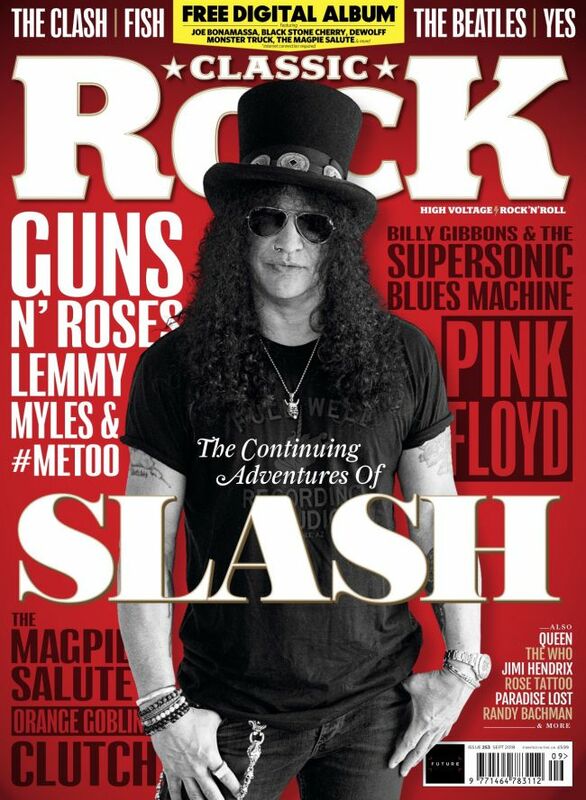 There's also a large interview with Slash about Guns n' Roses, plus plenty of other articles to keep you busy. The magazine is now available from all good UK stores, and will be in selected outlets worldwide in due course as an import. Alternatively, you can buy individual issues (again, worldwide) from this direct link.